Phase I of Blandair Park, now open to the public, encompasses 25 acres. Once the final phase is complete, the park will be 300 acres. 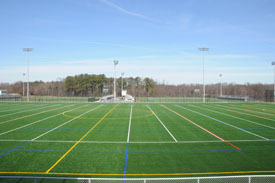 Amenities now available include three lighted synthetic turf multipurpose fields, press boxes and bleachers, along with a playground and a parking lot. Phase I of Blandair Park eventually will include a pavilion and comfort station. The park is conveniently located on Oakland Mills Road, one-third of a mile north past the intersection of Old Montgomery Road and Oakland Mills Road. Stay tuned for future updates on Howard County’s newest park!